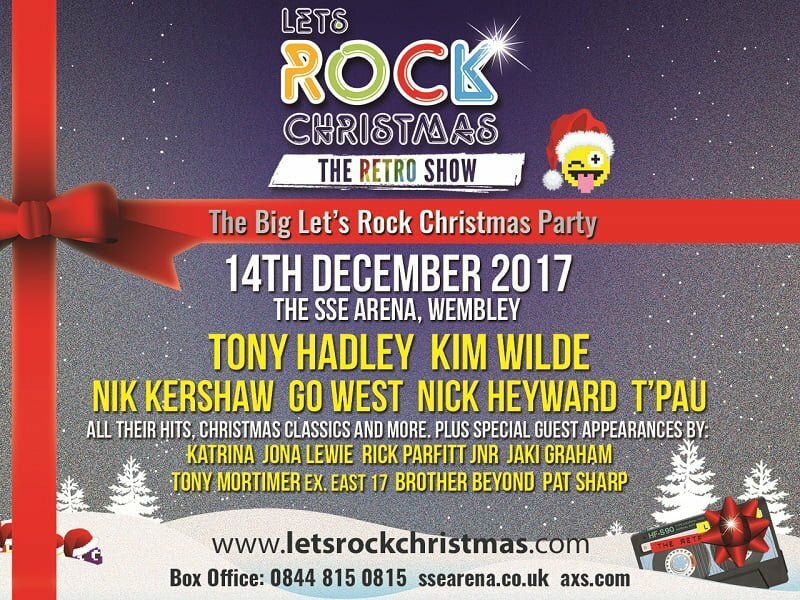 A huge new Christmas Party event celebrating the best music of decades past has been announced to take place on December 14th at The SSE Arena, Wembley. Tony Hadley, Kim Wilde, Nik Kershaw, Go West, Nick Heyward, T’Pau are all confirmed to appear, as are guests Katrina, Jona Lewie, Rick Parfitt Jnr, Jaki Graham, Tony Mortimer (ex-East 17) and Brother Beyond. Pat Sharp will host proceedings, as well as perform on the night, in what promises to be the perfect evening of non-stop hits from some of the world’s biggest selling, and best-loved artists. Let’s Rock Christmas promises to be the perfect way to get into the spirit of the season. Let’s Rock Christmas’ inaugural event comes in the wake of the continuing success of the Let’s Rock brand, which hosts incredible festival line-ups all over the UK to hundreds of thousands of people each year. This particular event promises to be just that little bit extra special though, with the artists performing not only their catalogue of hit singles, but Christmas classics as well, along with a multitude of guest appearances. Tony Hadley achieved worldwide fame as a member of Spandau Ballet, topping the charts with hit single “True” and leaving a legacy of no less than eight UK Top 10 albums, before embarking on an illustrious solo career. With over 10 million album sales, Kim Wilde burst onto the scene with the 1981 single “Kids In America” and is still going strong, performing to thousands of fans each year. Also on the bill, one of the world’s most successful and iconic songwriters Nik Kershaw brings his incredible show to London, Brit Award-winning “We Close Our Eyes” band Go West get the party started and Platinum selling former Haircut 100 frontman Nick Heyward joins along with “China In Your Hand”, “Heart & Soul”, and “Valentine” hit-makers T’Pau. As the sun sets on 2017 and Let’s Rock Christmas brings the curtain down on the year’s festival experiences, be sure to come and join a Christmas party unlike any other. I missed out on the Christmas 2017 Lets Rock, and you never had one last year (2018). So I’m sending you this message. It would be really Brilliant if you could do a 2019 Christmas Lets Rock. I have some Great ideas for a Christmas line up, lol. But seriously it would be so cool. I would be really grateful if you could reply back to me.